Did you know we could save up to 75,000 trees if we just started recycling the paper used in the New York Times’ daily run? No matter where you want to make your impact, or even if you just want to learn a little bit about the planet you live on, this course in environmental science can be the next step on a lifelong journey. Learn about climate change, planet Earth, and its resources, and start your environmental science education today. Environmental science has the potential to change our lives and the future of planet Earth in countless ways. Great minds across the world are joining forces to make that future better, and you can be one of them. This course starts by giving you an understanding of the effects of climate change on earth's important processes. It then moves on to provide a clear overview of what we can do about it. Next, the course explains the basics of pollution control and mitigation, overviewing important steps that have been taken and need to continue. The course then covers natural resource management and the importance of global water supplies. With this basis, you can progress your environmental science career and education in whatever direction you choose. Without serious attention being paid to these issues, the future of our planet might be in trouble. But you can make a difference, if you work at it. With some time and dedication, you can gain skills and knowledge that are increasingly needed around the world. Your motivation can really make an impact, so keep going and contribute to something really big that you can be proud of. 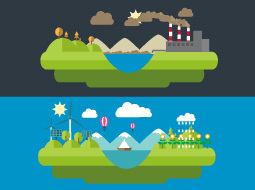 Upon completion of this course you will be able to: - Describe the earth and its system; - Demonstrate a good understanding of its resources; - Recognize the factors that affect our environment; - Differentiate between renewable and non-renewable energy sources; - and discuss how to manage water supplies.